CBS Sustainability is the hub for sustainable research and practice at Copenhagen Business School. We are continuously developing new ideas and plans to make sustainability a more prominent part of campus life for everyone – from the students to the faculty. CBS Sustainability is committed to initiating and participating in efforts to make sustainability a more integrated part of the CBS experience through sustainable initiatives and events. Below you will find an overview of some of the current sustainability initiatives at CBS. 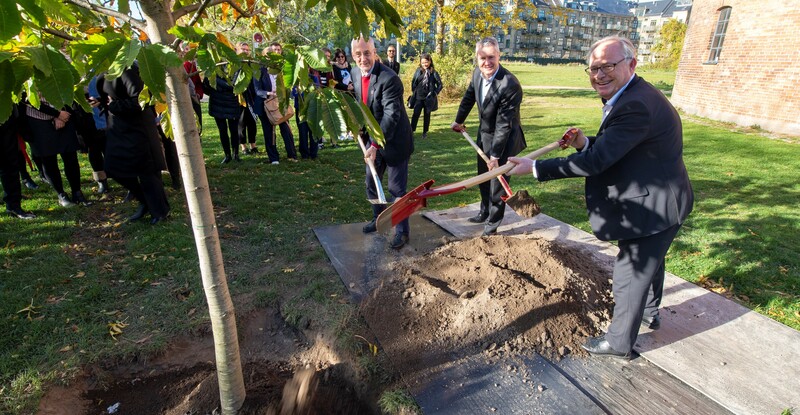 CBS President Per Holten-Andersen and Mayor of Frederiksberg Jørgen Glenthøj plant a tree on campus for the 73rd UN birthday. Overall, a vegetarian menu performed better than a meat based on impact factors such as global warming, water consumption, etc. Read more about the first vegetarian policy implemented at CBS below. Vegetarian orders for events at CBS can be made on Spisestuerne's website. Save paper by making your event paperless. Designing posters of the event/conference programme and placing them in A signs is a good alternative to printing programmes for all participants. You can also consider having a conference app where participants can access all necessary information. At the Sustainable Consumption Conference 2018 the app Sched was implemented. For every time the bottle is reused the impacts are divided out on the total number of uses. This means that the second time a bottle is used the impacts are divided in half. The third time it is used it will only be credited for 33% of the total impact. When the reusable glass bottles is used for the 7th time, it will be a more sustainable solution. Visit Retap's website for more information about their bottles. It is the ambition the sustainability initiatives implemented at the Sustainable Consumption Conference are to set a new standard for hosting events and conference at CBS. This ambition has resulted in a Sustainable Event Guide which offers suggestions for initiatives to make CBS events more sustainable. In March 2019, the next version of the Sustainable Event Guide was released by CBS Sustainability, which includes new initiatives. The new guide can be used internally at CBS and shared externally as well. By the end of 2017, Spisestuerne launched their new initiative against food waste: food-waste boxes. Every day from 14.00-14.15 and later from 19.00, anyone can fill a box with leftovers for a set price of DKK 15. Spisestuerne throws out 3-5 percent of the food from the five buffets around CBS’ campus. By implementing this initiative, Spisestuerne has managed to reduce food waste. Furthermore, they have gained valuable experience and can improve their food production strategy in the long run. It is through initiatives like this that turn CBS' campus into a greener and more sustainable place. Read more about Spisestuerne's effort to reduce waste here. In October 2017, The Department for Management, Society and Communication implemented the first vegetarian policy at CBS. The vegetarian policy entails that whenever a colleague wishes to order food for an event, only vegetarian food will be served unless otherwise requested. The setup mirrors how dietary requirements are currently specified except that from now on people wanting a meat-based meal have to specify this wish. The default will therefore not undermine the freedom of choice as anyone who wants to eat meat is free to do so. With support from the department and in close collaboration with Spisestuerne, the policy was rolled out as a pilot project over the following 6 months. After the trial period, the effect of the policy received positive evaluations from the institute's faculty, and the policy has been permanently implemented. Since its implementation in October, the department has received information on 508 ordered meals, whereof 375 meals (74%) have been vegetarian. The Danish Ministry of Foreign Affairs has played a significant role in getting the UN SDGs into teaching and curriculum in Danish highschools. Besides implementing the 17 SDGs as a highlighted learning outcome, together with UNDP, Globale Gymnasier and others, the Ministry of Education has developed a teaching platform with teaching materials on the SDGS for highschool teachers which you can find at www.verdensmaalene.dk. Among the first effords of the SDG Task Force is a document of recommendation on CBS Flight Sustainability. Click the link below to view or download.